This recipe was originally published on Weelicious as "Nachos". Place 1/2 of chips in an oven safe dish or on a cookie sheet. Cover with 1/2 of the cheese and beans. Cover with the remaining chips, cheese and beans and bake for 10-15 minutes or until cheese is melted over chips. 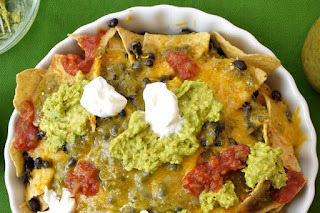 Top with guacamole, sour cream, salsa and or olives.